Clink clank clunk goes the dryer. I'm trying to catch up on my laundry after two days of slacking in that department. Although I must give myself the benefit of the doubt there and blame the fact that we spent our weekend falling, pulling & piling logs for our firewood. A bit hard to do any laundry while your not home. We almost literally dragged ourselves into the house last night. Our little guy is camping with my parents so we decided to make a full day of the firewood work. We cut, pulled and piled up those logs until it was dark enough that it really wasn't safe to do so then called it a night, it was almost 8 p.m. by this point. I knew we'd been working hard (getting up and down off the tractor to set and unset a choker is a pretty repetitive job) and Banning's face was covered in dirt. Well hello, he was the one tramping around the woods falling trees and delimbing them so I really wasn't surprised to see how filthy with dust he was. But I was surprised when I looked in the bathroom mirror and realized I was just as dirt riddled as him! Whew, that shower felt soooo good. And so did the bed that we crawled into last night. No rest for the weary, he's at work today and I'm catching up on laundry and house work...we'll be back out cutting wood and getting gritty again next weekend, it's a necessary evil at our house. Today I've fished out the last of my frozen cranberries and canned cranberry sauce! Yum yum. My husband will eat this out of the jar like it's some kind of dessert, and he's not too far off in my opinion! We are fortunate to live only a few hours away from the Washington coast. Some years back I found out that Ocean Spray owns cranberry bogs down there! That was it, I was on it! A friend and I took a road trip and ended up here: Cranberry Museum What a wonderful little place. Take yourself on a self guided walking tour during the month of October and you'll be able to watch the cranberry harvest. The gift shop is full of all sorts of goodies from cranberry soap, cranberry cookbooks, cranberry vine wreaths and low and behold fresh cranberries to purchase...by the pound!! I dove in and brought home a box!! It was a big box!! But the wonderful thing about cranberries is that they keep in the freezer...a long time! This worked out wonderful for me, I could make homemade cranberry sauce at my leisure! We've made it a bi-annual trip (well almost, haven't been back in approx 3 yrs) but am going to set aside time this year to make that road trip happen again! So, today I pulled the last few bags of those berries out and canned them up. so nice when the water boils right away! the end result...love the sound of lids 'popping'!! I also have a recipe that I've made a few times in the fall. My husband has taken it to work and shared it with 'the guys' and they all make requests for it lol. It's a orange/cranberry bread and it's fabulous. You can find the recipe here: Taste of Home - Orange Cranberry Bread let me know if you try it!! Oh, and I highly recommend using a food processor to chop the cranberries if you have one. I'm not sure what it is about this time of year but it makes me nostalgic for some reason. Maybe it's the harvesting of the garden and canning that my parents used to do. The crisp mornings, last of the sleeping in before the dreaded start of the school year. Yet, there was also much anticipation in that too. Our middle school used to post a class list on the front doors a week or two before school started and we'd eagerly ride down there with our parents and see who our teacher was and which of our friends we'd be having class with. Or once we entered high school and suffered the anxiety of waiting for the mailman to bring the envelope that held our class schedule. Ugh, talk about misery! I miss those days looking back on them now. There are many things I miss from my childhood. Including the days of walking barefoot in the garden, hiding in the rows of the tall corn and digging my toes into the cool rich soil. Pulling carrots out to munch on after just a quick rinse of the garden hose....those carrots had the sweetest flavor! Mom spent hours in the kitchen cutting and canning pears and peaches for the winter months. When the season was over the shelf in the cold dank cellar would be filled with the goodness of those fruits. My mother in laws garden went crazy this year! Last year it was such a big disappointment that we were both so discouraged, but at the same time very determined that it would do better this year! Well, this spring I severely pulled muscles in my neck and was not able to help her plant or weed for most of the summer. Now it's rich and ready for the picking and I'm feeling guilty each time I receive the wonderful fresh vegetables that she labored over. But she's such a sharing person and I'm grateful for that to no end. AND I have vowed not to injure myself next spring and help her plant another bumper crop! So on these mornings, while I'm sipping my coffee and planning a day of preserving fruits & veggies for my family I'm also counting down the days until my son starts his first year of full days at school. Then I smile as I remember a childhood that wasn't always easy but provided me with happy memories that I'm able to share with him. Today was the day, it was the day that my redneck clothes line went back up!! Banning took it down a few months ago when we were cleaning our deck off in anticipation of having company in the back yard. Apparently to him it was an 'eye sore'. Ha! Maybe so, but nothing beats the smell of our sheets 'line dried'...so this morning the post was put back into the corner of the deck railing, bungee-cord secured it nicely =) and the line ran diagonally across the deck and secured under the eve of the house. As I type this my sheets are happily (can sheets have emotions?) flapping in the wind! My childhood memories are full my mom hanging clothes on the line. And having 6 kids that's a lot of clothes. I long for the day that I can have traditional non redneck looking T-posts to secure a couple lines to. Funny, Banning didn't mind when I had one in the backyard of our first place, but now that traffic drives by and can see our undergarments on display I don't think he's too gungho on the idea. Go figure! Another way I dove deep into my family roots was to can a several jars of pickled beets. Mmmmm the house smelled wonderful!! The beets were pulled fresh out of my mother in laws garden last night and the prep work/canning complete by 3:30 this afternoon. I look forward to tasting those sweet wonders in a few months. Tonight I'll be cooking up a few of the bigger ones that we pulled. Cameron is very excited to try cooked beets. I hate to think of him not liking them, but I know my son and I know his taste buds...liking them is probably not going to happen. What I do appreciate is that my son is willing to try them. He's also looking forward to trying the greens. That will be a first for both of us as I've never had those myself, so I'm looking forward to that. 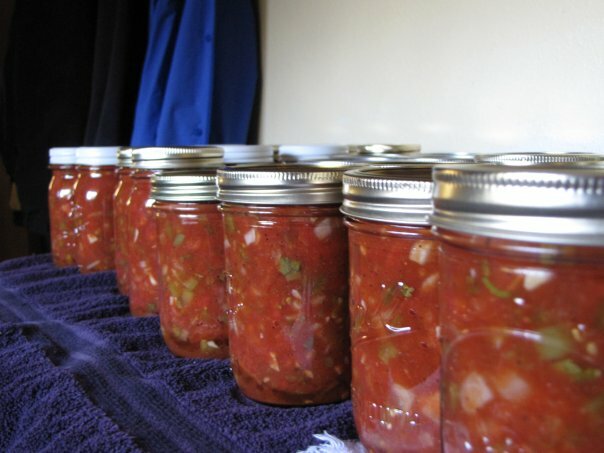 Hoping by the end of the week I'll be knee deep in preserving more foods. I think Dill Beans are next on the agenda....oh and possibly some sauerkraut =)! ...with this blogging isn't as easy as I thought it would be. But I'm trying...really trying to make an effort to get back into the swing of it! Vacation to Disneyland was, well fun but tiring to say the least! My niece asked me if we'd be visiting the local county fair that is going on this week & ending this weekend. I shudder at the thought and asked her not to mention it around my son. Right now I have absolutely no desire to be in crowds of people lol. I must admit though, a huge theme park such as Disneyland is second only to an international airport for people watching. If I didn't have a child with me I think I could have donned my sunglasses, found a nice shady spot to sit and people watched for most of the day. We had many compliments on our first names. There was a cashier that worked one of the gift shops, said she'd been there for over a year and a half and had never come across another person with the first name Pepper. I was pretty surprised by that, I've met 2 in my 35 years and I don't get away from home much. The two I have met have been local too, go figure! I can say it's great to be home. I reflect now on the many different personalities that we came across on that adventure of ours. Met a few nice and interesting families at the hotel pool and while standing in a few lines. Had a great waiter at Bubba Gumps Shrimp Co restuarant at Universal Studies. What a great place to eat! Even Cam wanted to go back, although he wasn't willing to pay the tab so going back was pretty much out of the question. I highly recommend eating there though, if you have a few extra bucks to blow on a dinner. that anytime soon! Grin from ear to ear! It was a whirlwind 7 days! The boys loved playing in the hotel swimming pool too. We arrived on Tues Aug 3rd and starting hitting the parks on Wednesday. The only break from Disney was Fri when we spent the day at Universal Studios, then Sat it was back to the Disney parks. The best way we found to work it was to hit the parks early and be out by 12 or 1 and in the pool at the hotel relaxing. Six solid days of theme parks and we were all pooped! I figured my body was going to be tired at the end of all of it, but mostly it was my brain...people overload!! Glad to be back in my podunk small town lol. If you plan on a Disneyland trip anytime soon I highly recommend using the Fast Pass option to see the World of Color show, it was spectacular. One night of being at the original park for the fireworks is also a must..so glad we did it! Even though we could see the fireworks from our hotel room it was nothing like being right there and experiencing the music and themes that went with each burst of rockets!! Wonderful! !